I just got back from Turkey, where I spent three weeks visiting family and enjoying great food and wonderful hospitality. I stayed in Çesme (meaning fountain in Turkish), on the west coast of Turkey, famous for its clubs, beaches and fish restaurants — and stray dogs! Each morning my father and I climbed the beautiful hills lined with wild oregano to shed some kilos gained from all the food my mother had been cooking for us. We walked past farms which were guarded by the native Anatolian Shepherd Dogs, warning us to keep our distance. I couldn’t help but look over my shoulder nervously as I passed these big dogs that walk around freely all day, but they stood their ground and let us go on our way. Dogs in the surrounding townships are a different story. 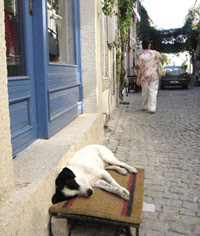 Whether you go to the market or walk down to the local store, you see stray dogs lying around everywhere. I came across one sleeping almost in the middle of the road! How he didn’t get run over, I don’t know. Another stray was keeping a group of tourists company as they sipped their morning çay (tea) at a garden café. I saw one Jack Russell cross sleeping peacefully at the foot of a small shop. Occasionally, a dog would walk by and meet up with other strays congregating nearby, as if they were meeting for lunch. Leftovers at the local restaurant perhaps?